What’s rectangle shaped, red, and climbs almost 11,000 feet in less than 10 minutes? It’s the Jackson Hole Aerial Tram. Nicknamed Big Red, the aerial tram provides access to Rendezvous Peak (that’s 10,450 feet). What awaits at the top of this vertical climb of 4,139 feet? 360-degree views of the Grand Tetons and Jackson Hole valley! The Jackson Hole Aerial Tram climbs to the top of Rendezvous Peak in only 9 minutes. 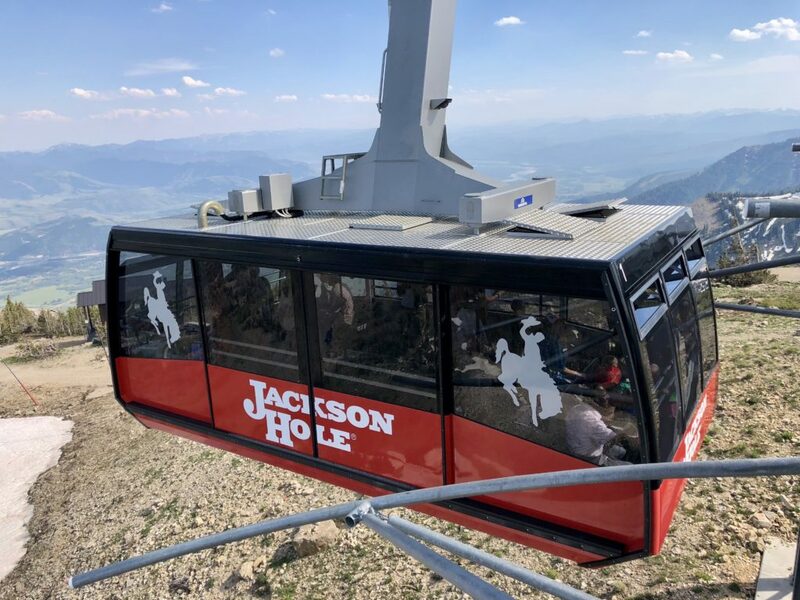 Jackson Hole has many amazing modes of transportation, but one of the most memorable has to be the Aerial Tram at the Teton Village. Aptly nicknamed Big Red because…it’s red, this gliding gondola escorts passengers up to the summit of Rendezvous Mountain. It made us wonder: how this amazing feat of engineering come to be? Originally, the Jackson Hole Aerial Tram was built in the heart of the Grand Tetons and completed in 1966 after 26 months of construction. In 2006, the tram was decommissioned and plans were put into place for a replacement. This new version was completed in unveiled in December 2008. Tip: Purchase the Family Tram Ticket online for 2 adults and up to 4 juniors: $ 86/$97 peak season. Bonus: Kids 5 and under are free, so make sure you price it both ways to see if you need a family pass or would be better off individually. Once up top, take in the amazing views. And don’t miss the waffles! Corbet’s Cabin specializes in made to order with delicious toppings like brown sugar butter, Nutella and strawberries, lemon glaze, and peanut butter and bacon. They also has a great selection of hot and cold drinks, beer, snacks and tram souvenirs. 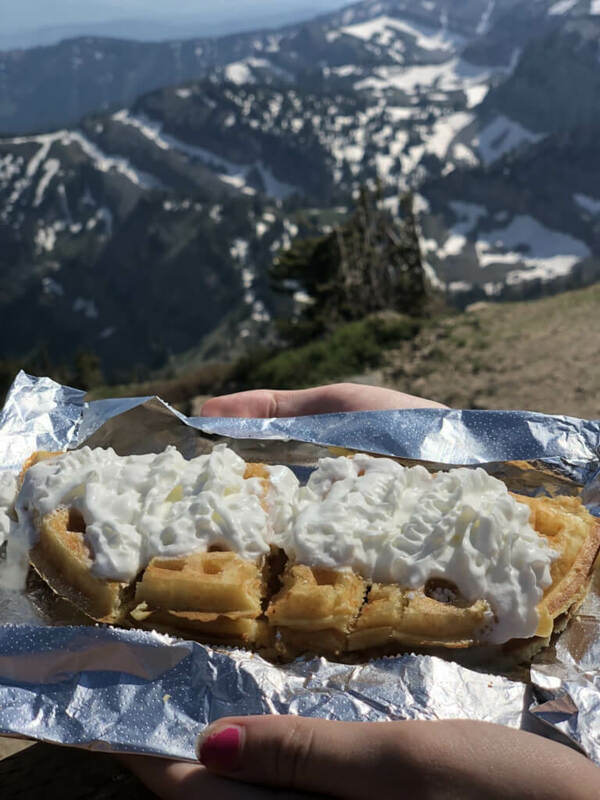 Between the views and the waffles at Corbet’s Cabin, this is a definite MUST DO. Drink plenty of water on the aerial tram day because the elevation is almost 11,000 feet. Learn more about Jackson Hole, Grand Teton National Park, and why families should choose a dude ranch vacation.